And I thought my December was busy. Turns out Laura’s Cookies from Ohio made 40,000 cookies that month! Years ago, my oldest sister lived in Oakwood, Ohio- and her friend Laura was always getting compliments on her cookies. She approached her local (awesome) grocery store – Dorothy Lane Market – and asked if she could start selling her cookies there. Her cookies were an immediate hit! 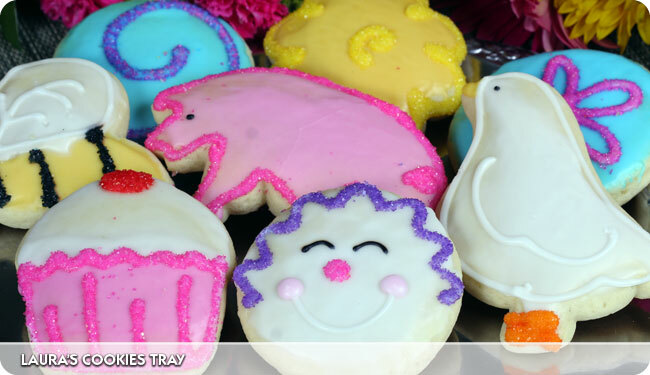 My family has always loved her cookies and now you can mail order them online in so many fun shapes and sizes. I can’t even imagine how many she is making for Valentine’s Day- so if you want in, be sure to order next week (click here) so they arrive on time. This is a great gift idea – I really don’t think you can go wrong sending someone cookies! This is an amazing story!!! Just received this discount in case anyone wants to order- Please enjoy 15% off your order using discount code: LOVE2010. Offer Expires February 15, 2010.
thought you might be interested to know someone else is passing off lauras cookies as her own..